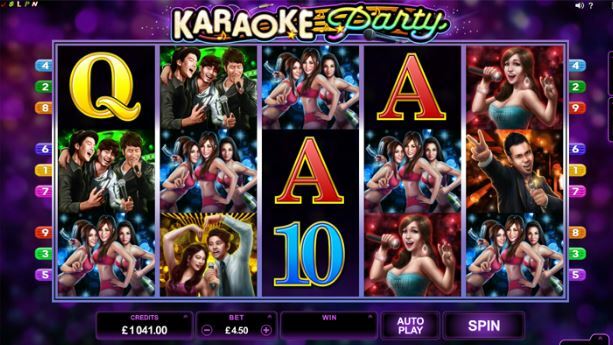 Karaoke Party is a bright and vibrant 5 x 3 reel, 9-line slot powered by Microgaming that captures all the fun and excitement of a Karaoke Party with your friends! The slot pumps out an upbeat soundtrack with a synthesised melody and modern rhythmic beats, which will transport you into a haven of pop classics. You’ll find yourself bobbing your head, clicking your fingers and tapping your toes as you groove to up to 150,000 in wins. The Karaoke Party logo acts as the Wild symbol. Every win made with the Wild is doubled! 3 or more Scatters anywhere on the Reels will award you with 15 Free Spins with 3x Multiplier and the spins can also be retriggered during the feature, so you have a chance to rack up wins over and over again.